Bath oil with natural orange essential oil, wheat bran extract and the truly moisturizing Soft Skin complex. 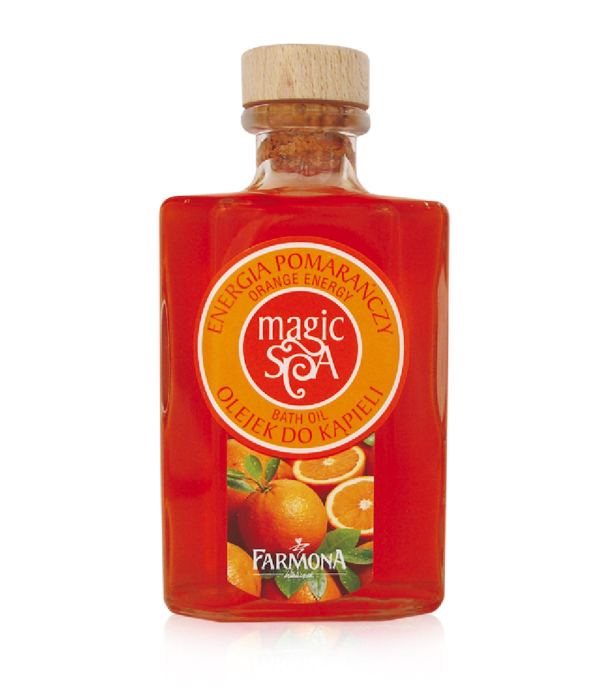 The refreshing citrus scent puts one in a good mood, guarantees wonderful freshness and relieves from stress. It brings back internal harmony, balance and comfort. The bath embraces us with a sensual scent of Spanish orange groves. The muslin foam, nourishing wheat bran and the moisturizing complex leave the skin silky smooth, soft and delicate. Pour 25 ml of oil under the stream of warm water. Recommended bath time: 20 min. Natural orange essential oil, wheat bran extract, Soft Skin complex. Aqua (Water), Sodium Laureth Sulfate, Cocamidopropyl Betaine, Sodium Chloride, PEG-7 Glyceryl Cocoate, Polysorbate 20, Propylene Glycol, Triticum Vulgare (Wheat) Bran Extract, Glycerin, Citrus Aurantium Dulcis (Orange) Fruit Extract, PEG-150 Pentaerythrityl Tetrastearate, PEG-6 Caprylic/Capric Glycerides, Panthenol, Citric Acid, Disodium EDTA, Methylchloroisothiazolinone, Methylisothiazolinone, 2-Bromo-2-Nitropropane-1,3-Diol, Parfum (Fragrance), Limonene, Linalool, CI 19140, CI 16255.